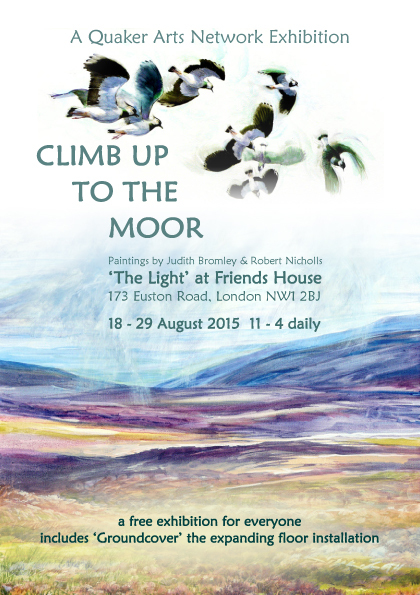 Earlier this week I went into Friends House specifically to visit this exhibition – and thoroughly enjoyed it. Gorgeous colours and textures shown off beautifully in the space, the sound track enhanced the art as you moved around the exhibit. There were several Ffriendly faces that I recognised, but there were also others who had been tempted into the space because of the art. I was delighted to see such an event and was glad to hear that it had been busy and attracted people who were in Friends House for other reasons as well as those attracted by the exhibition. I’ve known several meeting houses hold similar events – ranging from small displays in the lobby to larger installations which fill the entire building. Kingston Quaker Centre, which opened in September 2014, built in picture display rails to the main communal area with the expectation that they will hold exhibitions at some time. So why hold such an event? It can be a form of inreach – a way of supporting and encouraging members of the meeting, members of the wider Quaker community (Area Meeting to Yearly Meeting and beyond) who are artists professionally or as a hobby. It can involve artists in other faith groups who are producing spiritually inspired work on a similar theme, encouraging discussion across boundaries. It can encourage people to visit the building who wouldn’t otherwise. A form of outreach and marketing – as visitors may remember the venue when they next organise an event. It can show regular visitors aspects of Quaker beliefs and testimonies in a way that a leaflet rack, no matter how well stocked, cannot. It can inspire discussion and exploration of the themes within the meeting, with these discussions occurring across ages and involving the whole worshipping community. It can raise money for a specific cause or for general Quaker work or support the artists who created the work. It can be fun as the group work together to create something beautiful. Although the Climb up to the Moor exhibition was also a lot of work, done by a dedicated group from the Quaker Arts Network. Have you ever held an exhibition at your building? Have you any hints or tips to help such an event go smoothly? This entry was posted in Outreach, Quaker A-Z by Wendrie Heywood. Bookmark the permalink.